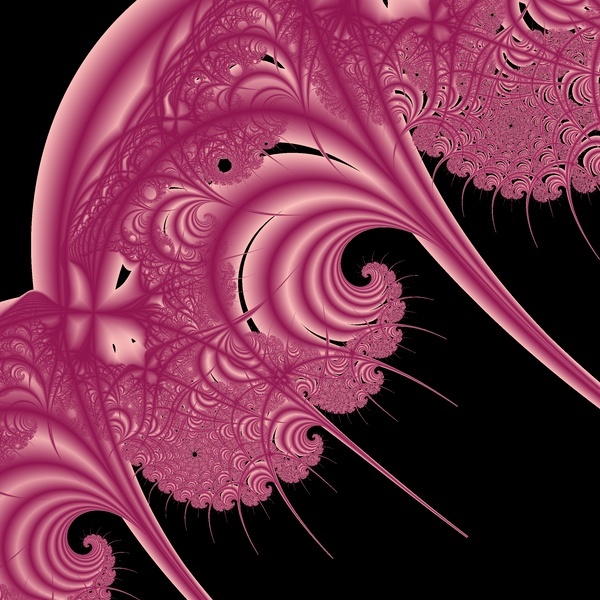 Let’s review a few facts about color maps in Fractal Domains. A complete description can be found in the manual. At every point in a fractal image, Fractal Domains assigns a number which we call a “dwell.” A color map is a list of colors that are assigned to these numbers. There are many more numbers possible than we could list colors for, so a color map only assigns colors to a few “dwells” and the colors for the rest are assigned by interpolating between the nearest values that do have colors. The fewest number of colors a color map can have is two, assigned to the minimum and maximum dwell. There can be up to thirty two values that have colors explicitly assigned. We call each of these values, along with the assigned color, a “color break.” Every region in a Fractal Domains image can have its own color map. A random color map is generated separately for each region. For each color map, the number of color breaks is chosen randomly. This can be any number from two to thirty two. All numbers in this range have an equal chance. 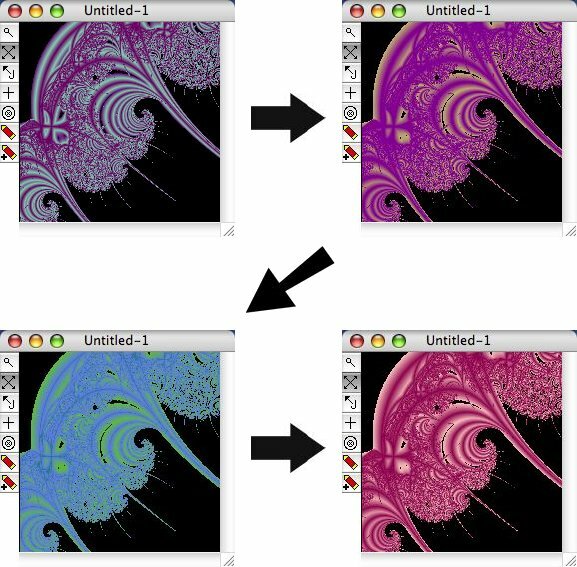 For each color break, the value associated with that color break is chosen randomly, or to put it another way, the available color breaks are spread randomly over the range of fractal values. Then, for each color break a color is randomly assigned. The color is chosen randomly from all available colors. Let’s take a look at the Randomizer window and see how changing a couple of simple parameters can give us much more control over the generation of color maps. 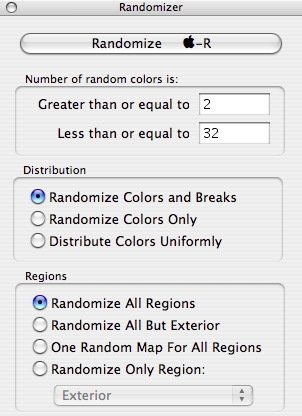 First of all, we can modify which regions get a new color map in the bottom section labeled “Regions.” We can prevent the exterior from being changed by selecting the radio button labeled “Randomize All But Exterior,” so let’s click that button. Furthermore, we can limit the maximum and minimum colors generated in a new map by using the upper section. We could force every map to be a simple gradient by setting the “Less than or equal to” field to the number two. Let’s try “three” for a little more variety. Then we set the background to black and try some more random maps. (You can either press Command-R or else click the “Randomize” button in the Randomizer window. Obviously, setting the “Randomize All But Exterior” option saves a lot of trouble when you want the background to remain a single color. In addition, setting the maximum number of colors to a small number can help generate effective color maps for trap regions. Let’s do some more work with this image. Suppose we wanted to use a region split for more variety? We’ll try this on the next page.